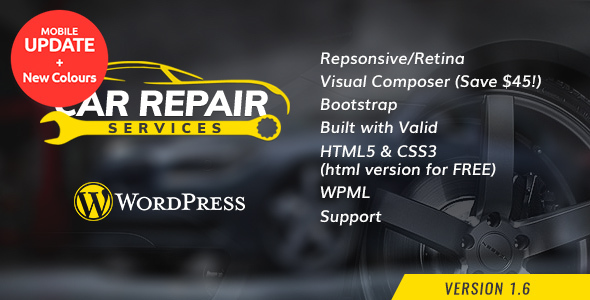 We have compiled a list containing the best responsive auto service WordPress themes that will be ideal for car shops, mechanics, car services, automotive blogs, car specialists, car diagnosis, and other car related businesses. All the themes presented here were carefully selected to be fully responsive, intuitive and easy to use for beginners, SEO optimized, translation ready, and WooCommerce compatible. They will help webmasters develop distinct and powerful websites without having to code or hire web developers. 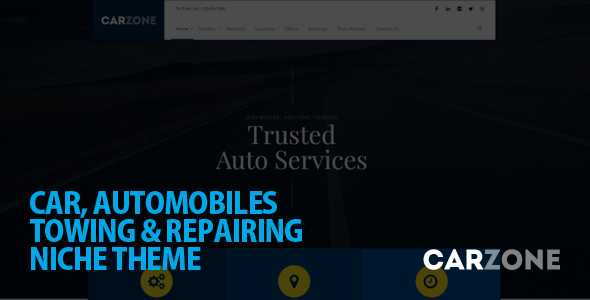 Apart from the features mentioned above, these 13+ auto service WordPress themes come with custom car related features. Furthermore, all of them have the option to import the presentation content and layout to make it easier for users. Additionally, they all come bundled with Visual Composer and Revolution Slider both useful for creating unique page layouts. Take the next step and bring your business closer to success with a premium car service theme. 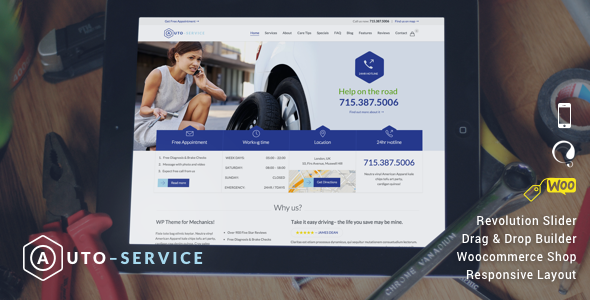 Schremp is a professional looking and flexible theme that molds perfectly for auto repair shops and services. It was developed and designed by Templines with the sole purpose of becoming a power tool for car repair websites. You can create an impressive website using different header styles, typography options, live customizer, premium icons, 100+ shortcodes and widgets, Revolution slider, and Visual Composer. Schremp requires no custom coding on your part thanks to its intuitive and user friendly theme panel. Auto Repair is one of the best auto service WordPress themes due to its flexibility, minimalist design, and top notch functionality. With Auto Repair you can develop a website for your business in a few minutes. You can also add content to it with a one click demo import option. This theme is armed with several designs for the homepage and header, a complete responsive layout, multi footer designs, Google fonts, a review section, and custom sidebars. Auto repair offers its users a complete experience! Car Dinal has a perfect score of 5 stars and it is not hard to see why. It is one of those auto service WordPress themes that will impress you and your audience at the same time. Car Dinal makes it easy to craft a cool website thanks to its admin panel, Revolution Slider, and Visual Composer. Using these 3 elements you will simplify your work tremendously while still creating stylish layouts. Furthermore, you also get a detailed documentation, sidebar manager, dozens of shortcodes, shop layout, and free support. Try Car Dinal! Car Zone is a stunning, flexible, incredible, ideal, and responsive auto service WordPress theme. It fits perfectly in this niche and will be a great choice for car services, auto repair shops, and other car related businesses. With Car Zone you get to create custom booking related emails to send your customers, various typography options, business hours section, 5 header styles, and sticky menu. It has a clean design and a simple to use admin panel. Keep your clients close with Car Zone. 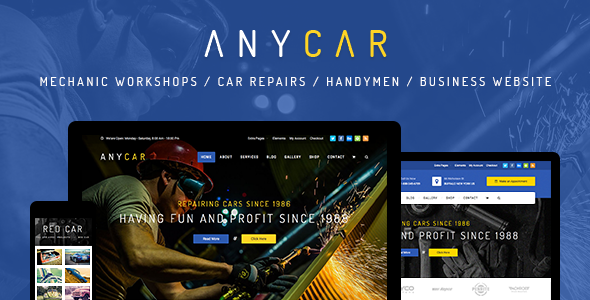 Show off your business and services with AnyCar. This theme comes with a ton of options all found in the theme’s panel. There is no coding required for you to use Any Car to its maximum potential. The design is chic, clean, pristine, and tasteful. You can import the demo content in seconds through a one click installation, customize your header, use a pre-built front page layout, design your gallery, add a members section, and choose your color scheme. No matter the changes you make to this template, it will keep its responsiveness and adaptability to mobile devices. AnyCar will meet your needs! Let yourself be amazed by one of the best auto service WordPress themes. Car Service was built with skill and purpose to serve as an incredible solution for car related businesses that want to conquer the online world. Featuring a mobile friendly design, built-in premium plugins, appointment form, sticky side columns, hundreds of color options, demo importer, over 20 custom theme elements, and other 50 content elements. 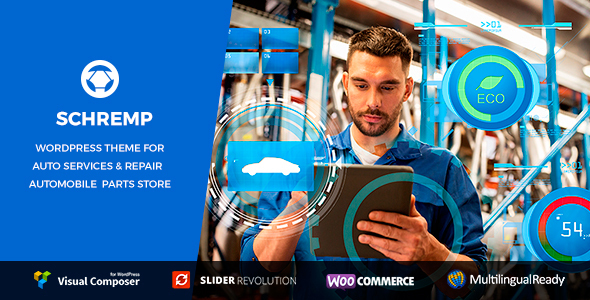 Car Service is integrated and compatible with WooCommerce allowing you to also build an online shop. Want to know more about this car service WordPress theme? Check out the live preview. 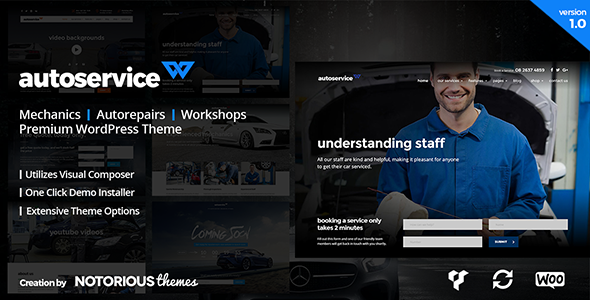 AutoService is a mesmerizing, wonderful, original, and imaginative premium car service WordPress theme. AutoService is packed with pre-made demo layouts that you can experiment with and see what fits the best. If none are a good choice, you can use the integrated Visual Composer to build some from scratch. You can add fixed or transparent headers, custom footers, fonts, maps, and sliders. Your design choices can be unlimited. Create a beautiful, contemporary, and distinct website for your car service business with AutoService. 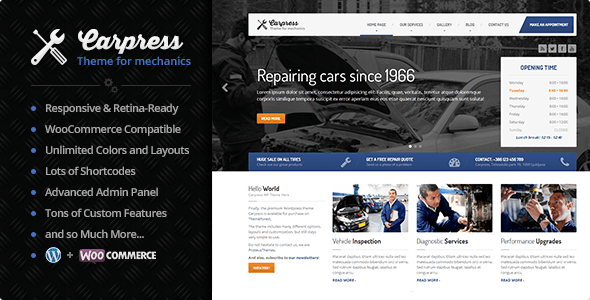 CarPress is the best-selling template from our list of auto repair WordPress themes. It is also the most expensive because it includes limitless options and features ideal for any type of business in this niche. CarPress is readily translated to 7 languages, retina ready and responsive, compatible with all popular plugins, has unlimited layouts, dozens of shortcodes, custom features, and video support. There is nothing you cannot do with CarPress and if you want to invest in a theme that will have your back, this is the one. 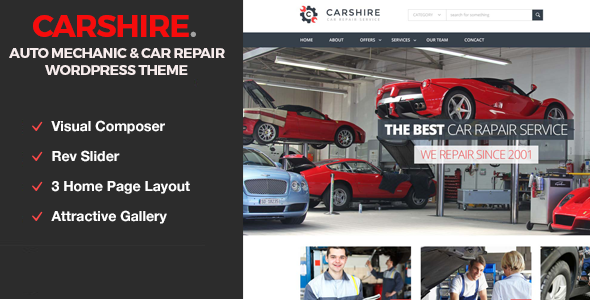 Even though Car Shire was developed as a car service WordPress theme, it comes with amazing flexibility and can be easily adapted to fit various needs and purposes. Car Shire’s design is clean, colorful, attractive, and user-friendly. It comes with a drag and drop page builder, premium slider, one click installation, translation ready, advanced typography, and a solid admin panel. All these options make custom coding unnecessary and make it easy to use for beginners as well. Get Car Shire today! 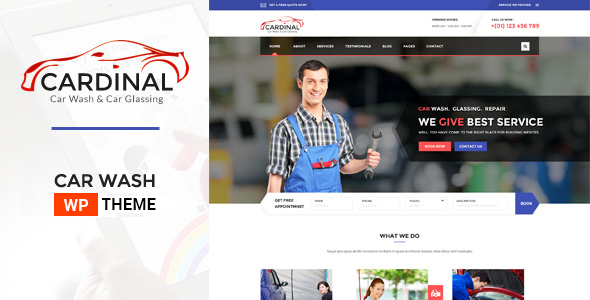 Car Repair is a professional, classic, robust, crafty, and strong auto service WordPress theme. Because this theme comes with Visual Composer it can be adapted to different purposes and businesses. You can also express your creative side using the advanced typography options, color schemes, icons, shortcodes, and widgets. Anything you do with it will look great on mobile devices and all browsers. Car Repair is the right choice for you. Get it now! 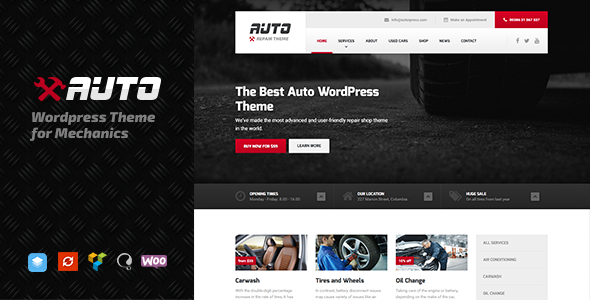 Auto is another amazing addition to our auto service WordPress themes list. Even if it’s designed to serve as auto repair theme its design is still gracious, appealing, and eye-catching. The list of features this theme contains is truly impressive starting with the built-in page builder, slider, and e-commerce plugins, widgets and sidebars, free PSD files, and more. You don’t want to miss out on this theme so give it a shot today! 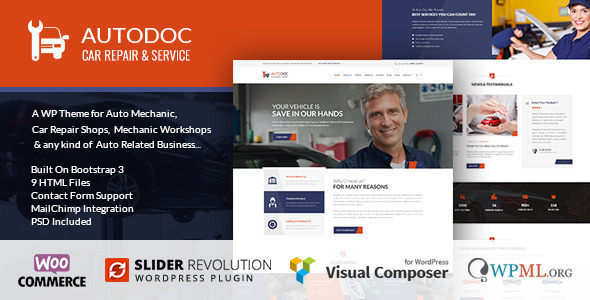 AutoDoc is a carefully designed and developed auto service WordPress theme packed with an incredible set of skills and tools. It is easy to install and set up, and all your content can be added using Visual Composer. Furthermore, it offers an intuitive theme panel that comes with tons of features and options. You can see in real time all the changes you make through the Live Customizer. This is one of the most powerful auto service WordPress themes and it also shines brighter than most. 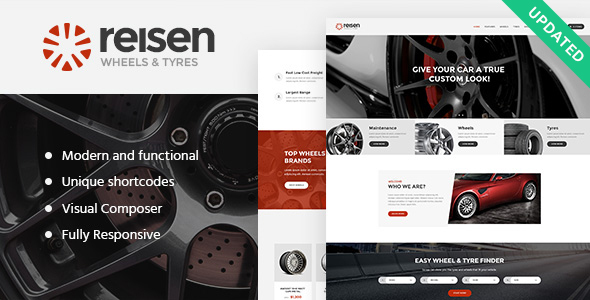 What makes Reisen be on this list as one of the best auto service WordPress themes? Well, for starters it is extremely versatile and multipurpose capable of adapting to car washes, mechanics, garages, blogs, and car stores websites. Reisen is equipped with a page builder, detailed documentation, WooCommerce, shortcode builder, navigation options, a powerful framework, and customizable design elements. 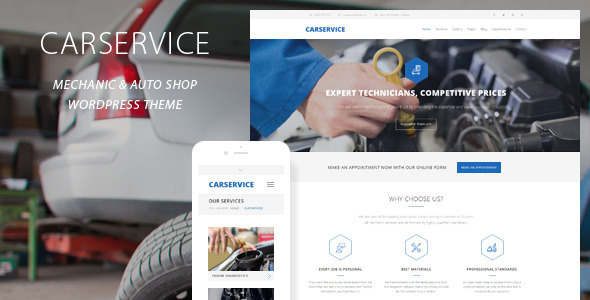 This premium auto service WordPress theme will fit perfectly and seamless on any screen size and browser. We have reached the end of our auto service WordPress themes list. We hope you enjoyed it and you found the quintessential theme to represent your business online. While we believe these are the best of the best, if you have any other suggestions drop us a line below. If you are interested in other car related themes, we also have an article featuring the best car rental WordPress themes. Make sure to check that out as well!